The Romanian director Corneliu Porumboiu has a style that’s likely—and I’m being super-optimistic here—a potentially acquired taste for mainstream American moviegoers. His best-known picture in this country is 2009’s “Police, Adjective,” a tense and mordantly funny drama whose examination of the ethics of law-enforcement (which climaxes in a marathon scene centered around the definition of the word “police,” hence the movie’s title) gained extra resonance for being made and set in a country that was for much of the 20th century more or less a police state. His best movies embody a kind of stylistic paradox: they are slow-paced, but also narratively concise; they contain long, slow scenes in which nothing in particular “happens” but they also feel entirely fat-free. Porumboiu’s new picture “The Treasure” is entirely in keeping with that mode but also expands on it, with disarmingly delightful results. It is in a sense the director’s first out-and-out comedy, and it’s also something of a fairytale. No sooner has the movie begun, with working man Costi (Toma Cuzin) invoking Robin Hood to gain his son’s pardon for picking him up from school late, than the not-thematically-unrelated premise pops up: Costi’s neighbor Adrian (Adrian Parcarescu) knocks on the door and requests an 800 Euro loan. 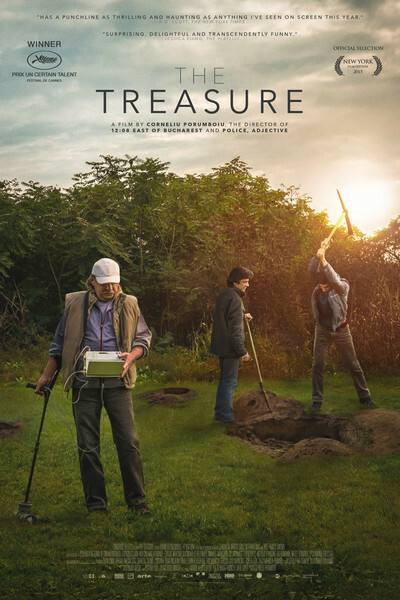 Costi’s pretty strapped for cash himself, so he demurs, but soon Adrian is spinning an intriguing tale: he wants the money to buy a metal detector to go searching for buried treasure in the yard of a relative’s house in the country. It’s a ridiculous idea on its face, and Costi’s wife implies as much, as they sit in their kitchen and discuss it. The white tile of that room is identical to that seen in Adrian’s apartment, and it brings home the humdrum nature of existence for the lower middle class in Bucharest; it’s like they’re all actually living on the set of “THX-1138." And even Costi and Adrian’s soon-shared dream of riches has a societal catch: if what they uncover is determined to have “state heritage” value they’re obliged to turn over the find to authorities, who will allow the duo to have 30% of its worth. Costi soon finds a metal-detector/treasure hunting “expert” named Cornel (Corneliu Cozmei) who’s willing to cut some corners and most importantly not rat out the fellows, and soon they’re in the village of Islaz with picks and shovels and a metal detector whose annoying noise means real encouragement for their prospects. Once there, the fellows discover that digging for treasure is no picnic, and Porumboiu is painstaking in depicting the hard labor and quiet frustration. By this time the movie has found a quiet comic tone that’s terrifically dry and droll. Trying to mask his activities from his boss, Costi goes along with that fellow’s suggestions that he’s involved in an extramarital affair, which admission first elicits the man’s nudge-nudge-wink-wink approval, then his mild disapprobation. It’s good absurdist stuff, a little reminiscent of the work of Aki Kaurismäki, albeit without that filmmaker’s wooly-headed whimsy. It does help, though, to be a good “Godot” person if you’re going to appreciate the push-me/pull-you tensions of the digging scene. After which come a few twists, which lead up to a denouement that, surprisingly enough, may prove richly satisfying to viewers more accustomed to conventional fare, provided they’ve been able to stick it out. The film’s final scene is both charming and hilarious and puts a delightful ribbon on top of what the film’s opening so sneakily established. I’m not sure if Porumboiu’s choice of a closing song—it’s by Laibach, just to let you know—is meant to undercut the ending or not. I don’t think it does. And even if it does, I’m not too concerned.